Somehow I managed to catch a cold in the midst of summer. And it’s not fun. You know why? Because I feel worse after eating my favorite coconut milk ice cream and eating coconut milk ice cream is my favorite summer activity. Instead of drugging myself with meds, I’ve taken a more natural approach, of course. So how do you cure a cold with natural remedies? Read on for my tricks. Reflexology:: This is my #1 secret that I’m sharing with you. Reflexology is wonderful, magical and seriously works. Years ago I discovered Holly Tse and her wealth of knowledge and free information. Bookmark her site - you will keep going back to it. Her cold-kicking routine has been vital in helping me feel better. Try this 5 minute routine when you wake up, in the middle of the day and before bed. 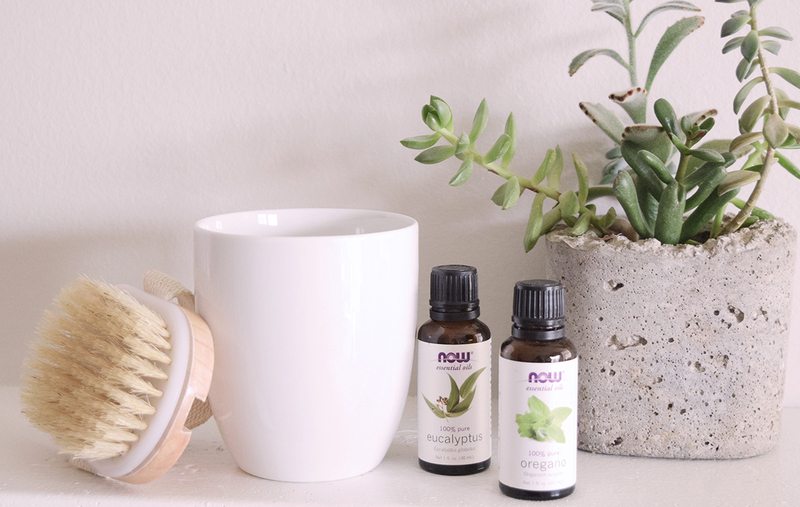 Eucalyptus Oil:: If you don’t keep a bottle or two of eucalyptus around, you need to add it to your hippie medicine cabinet stat. Eucalyptus is antibacterial, anti-inflammatory and a decongestant. If you have a diffuser, make use of it. If not, go old fashion and boil some water on the stove and throw a few drops of the oil in. For more intense healing, take the pot off the stove and drape a towel over your head and the pot to create a steam tent. I also like to apply it to my feet during my reflexology sesh and put a drop on my chest before I go to sleep. Oregano Oil:: Warning - this does not taste good but it is powerful and it works. Oil of oregano is antibacterial, antiviral and antifungal. It supports respiratory function and your immune system and relieves allergy symptoms (hello swollen, itchy eyes). It’s basically an all-natural antibiotic without all the nasty side effects Be brave and try this. Stir one drop of oregano into a cup of water and drink with a straw (the oil can irritate your lips if you take it straight). Stir and dilute as you go if it gets too wild, but I promise it will help. The Elixir:: Not for the faint of heart, this will give you dose of vitamin C, soothe a sore throat, ignite digestion, alkalize your system, clear your sinuses and warm you from the inside. Dump everything into a mug, fill the rest of the way with hot water, stir well and sip. You might need to stir it as you drink since the turmeric powder sometimes sits at the bottom. Lymphatic Support:: Your lymphatic system is your BFF during a cold. If you weren’t aware, this system flushes toxins out and transports white blood cells (which fight infections) throughout your body. So yeah, pretty important. To give it a bost when you’re sick, try dry brushing. I use one like this and use long strokes or small circles moving towards my heart before hopping into the shower. Also great for getting the lymph moving is some gentle yoga. I’ve done this sequence from yogi Shona Vertue a few times and it feels really amazing. Digestive Support:: By now, we all know that so much of our health starts in our gut. Healthy gut = healthy overall. Plus, if your body is fighting a cold, you want to give your digestive system some extra love so it doesn’t have to waste too much energy. Try a warm mug of bone broth (seasoned with pink Himalayan salt, turmeric, lemon and black pepper), sauerkraut, low sugar kombucha or a probiotic. If you’re currently feeling ill, I’m right here with you and we’re going to get better together. Even if you’re not sick, these are helpful practices for giving your body a little extra love. Off to massage some eucalyptus into my lung points so I can eat my ice cream again.